You had surgery to replace your damaged ankle joint with an artificial joint. This article tells you how to take care of yourself when you go home from the hospital. You had an ankle replacement. Your surgeon removed and reshaped damaged bones, and put in an artificial ankle joint. You received pain medicine and were shown how to treat swelling around your new ankle joint. Your ankle area may feel warm and tender for 4 to 6 weeks. You will need help with daily chores such as driving, shopping, bathing, making meals, housework for up to 6 weeks. Be sure to check with your health care providers before you return to any of these activities. You will need to keep weight off of the foot for 10 to 12 weeks. Recovery can take 3 to 6 months. It may take up to 6 months before you return to normal activity levels. Your provider will ask you to rest when you first go home. Keep your leg propped up on one or two pillows. Place the pillows below your foot or calf muscle. This helps reduce swelling. It is very important to elevate your leg. Keep it above heart level is possible. Swelling can lead to poor wound healing and other surgery complications. You will be asked to keep all weight off of your foot for 10 to 12 weeks. You will need to use a walker or crutches. You will need to wear a cast or a splint. Take the cast or splint off only when your provider or physical therapist says it is OK. Try not to stand for long periods. Do the exercises your doctor or physical therapist showed you. You will go to physical therapy to help your recovery. You will start with range of motion exercises for your ankle. You will learn exercises to strengthen the muscles around your ankle next. Your therapist will slowly increase the amount and type of activities as you build strength. DO NOT start heavier exercises, such as jogging, swimming, aerobics, or bicycling, until your provider or therapist tells you it is OK. Ask your provider when it will be safe for you to return to work or drive. Your sutures (stitches) will be removed about 1 to 2 weeks after surgery. You should keep your incision clean and dry for 2 weeks. Keep your bandage on your wound clean and dry. You may change the dressing every day if you like. DO NOT shower until after your follow-up appointment. Your provider will tell you when you can begin taking showers. When you do start showering again, let the water run over the incision. DO NOT scrub. DO NOT soak the wound in the bath or a hot tub. You will receive a prescription for pain medicine. Get it filled when you go home so you have it when you need it. Take your pain medicine when you start having pain so the pain does not get too bad. Taking ibuprofen (Advil, Motrin) or another anti-inflammatory medicine may also help. Talk to your provider about what other medicines you can take with your pain medicine. Murphy GA. Total ankle arthroplasty. In: Azar FM, Beaty JH, Canale ST, eds. Campbell's Operative Orthopaedics. 13th ed. Philadelphia, PA: Elsevier; 2017:chap 10. Wexler D, Campbell ME, Grosser DM, Kile TA. Ankle arthrtitis. In: Frontera WR, Silver JK, Rizzo TD, eds. Essentials of Physical Medicine and Rehabilitation. 4th ed. Philadelphia, PA: Elsevier; 2019:chap 82. 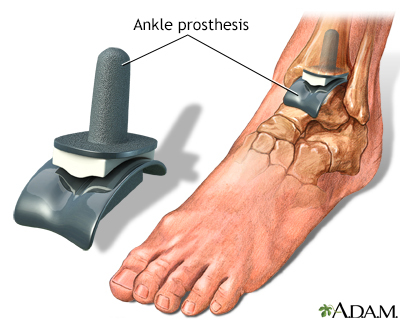 Ankle replacement involves replacing the damaged parts of the three bones that make up the ankle joint with artificial joint parts (prosthetic components) made of high-quality metal and plastic. The parts are typically held in place by bone cement. The artificial joints come in different sizes to fit the patient.